No letter this a.m. and since the P.O. closes at 1 p.m. I probably won’t get any until Mon. I contacted Arnold last night on the phone and he is going to look at the heating plant Mon. evening, so maybe by Tues. I can give you an idea whether he will take on the job. Vincent worked Wed. & Thurs. evenings and is going to work again starting Mon. He says he will soon have it done. I saw Juanita Schneider yesterday and gave her her gloves and got mine back. She said she wishes you would take to the Dr. who has been taking care of her husband when you get back to G.L. They are planning to come to Kentland when he can leave the hospital and she thought you would like to know something of his case history. She gave me his name, etc. I went to the beauty parlor this a.m. and got a new perm. Emma is booked ahead so far I couldn’t get an appointment for shampoo & set for 10 days. She won’t try to work in extra appointments. [page 2] for a dance they are to have Mon. I let him go to the Attica game last night. He went with Tooles. This morning he was telling me how Mrs. T. & Robert used so much swearing in their conversation. He seemed to think it wasn’t very good to listen to. He just asked me if he could go to the next out of town football game then he promised without any soliciting, to practice if I would let him go. David just came in with his hair tangled with burrs. I asked him how they got there and he said Jimmy S. put them in his hair. Fortunately I had cut his hair this week and it was so short I could slip the burrs out without doing any cutting. Mark got into a “froth” and was going right over and do things to Jimmy, but I quieted him down and sent him back to practice his music. After I got the burrs out without any difficulty I told him no harm was done. John is over at school this afternoon working on the school paper. He took a piano lesson this morning. He is to take an organ lesson tomorrow. He will want to go practice a while this afternoon – if he gets thru with his “editorial work” in time. I haven’t been to see Bobby yet but thought I would go this afternoon when they get their naps over. The whole house (except the maid) takes afternoon naps. Arlene was having a little difficulty explaining to Bobby why his throat was sore. He thought they weren’t going to take his tonsils out. David has gone to the basement – Mark is down there now working on an airplane – so I must go get David or he will be black. Dr. Pippenger sent you your Indiana State Medical Association card, so in case you want to attend the Indiana State Medical Association you will have your card. I’ll keep it unless you want me to send it on to you. 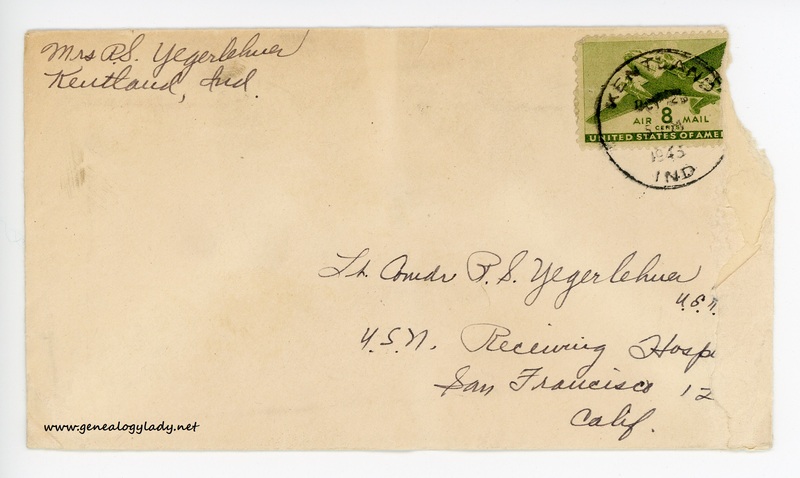 This entry was posted in Foster, Genealogy, World War II, World War II Letters, Yegerlehner and tagged Arlene Funk, David A. Yegerlehner, Dr. Pippenger, genealogy, Gladys R. (Foster) Yegerlehner, Indiana, James L. Staton, John F. Yegerlehner, Juanita Schneider, Kentland, Mark A. Yegerlehner, Mrs. Toole, Robert "Bobby" Funk, Robert Toole, Roscoe S. Yegerlehner, World War II, World War II letters on July 13, 2016 by Deborah Sweeney. No mail so far from you or from Dolores. Had two letters from Jim today – one written Aug. 1 & 15. He said we could guess from his address in what area he is. Had a card from Arlene. They are coming back Sun. She sent me a card with a picture of the 500 Bushel Club, Lake Gogebic, Marinesco, Mich. That is the lodge they own. Quite an impressive looking place. So far the Loughridges haven’t given me any figure on the oil burner, but I called Chet this a.m. and he promised it by this afternoon. I went to town this morning and got the lawn mower. It is in good “cuttin’” shape now. Mark moved the backyard again for the 3rd time in a week without a protest. We finally got all the weeds out and everyone agrees the yard looks much better. Mark is nailing the holes shut in the garage to keep the mice out of the attic. [page 2] as to when he will get home. Earl is still across, somewhere in France and wants his wife to join him if possible. We are still listening to the news to get any “info” about releases, but nothing we are vitally interested in has been said. Jim says he figures to be in for quite a while yet. David is taking a nice long nap. It’s cool today so he sleeps well. John received, I think, about $9.00 for his birthday. We had the Zell girls & Jimmy come over for ice cream & cake. He said he was well pleased with money for gifts. In fact said that was the nicest gift he knew of. The Zells are away today so Jimmy is hanging around with Mark. David & Jimmy like to play together – and with the Zell girls too. —Had a caller – Lucile Burgee with her little girl – Karen Sue – Gerhard is in France – doesn’t know when he will get to come home. I’ll have to hurry if I get this in the mail before the P.O. closes. I didn’t get any word from the Loughridges – so if I don’t hear from them tomorrow I am not going to bother them anymore. Evidently they aren’t interest. I saw Harold Portteus this morning – he said he hadn’t sent that night letter yet but thought he might get it out tonight. It’s about time for Mark to come in from his paper route so will get this finished. 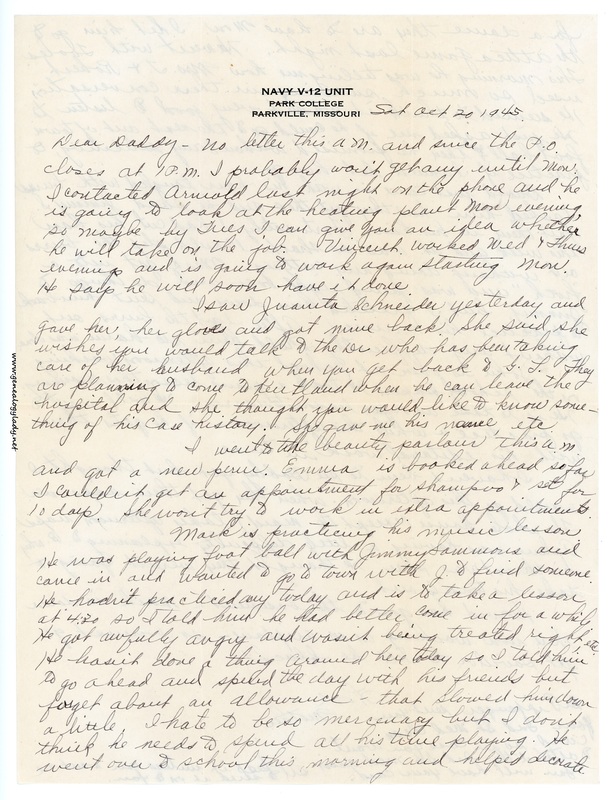 This entry was posted in Foster, Genealogy, World War II, World War II Letters, Yegerlehner and tagged Arlene Funk, Chet Van Scoyck, David A. Yegerlehner, Dolores L. (Yegerlehner) Stevens, Dr. Earl Roberts, Dr. Joseph Roberts, genealogy, Gerhard Burgee, Gladys R. (Foster) Yegerlehner, Indiana, James L. Foster, James L. Staton, John F. Yegerlehner, Karen Sue Burgee, Kentland, Loughridge, Lucile Burgee, Mark A. Yegerlehner, Mrs. Leila Roberts, Roscoe S. Yegerlehner, World War II, World War II letters, Zell on April 13, 2016 by Deborah Sweeney. As you will note from the heading we have spent the day with the Mutchlers and are all in bed except Ruth & Romaine. Ruth is in the bathroom & Romaine is out with Jerry. We came over this a.m. – Had dinner at 1 P.M. In the afternoon Earl began feeling worse from his cold and Ruth and I prevailed upon him to see a Dr. and he finally went to see Dr. Wilson. He came back with two kinds of medicine and got five does down before we started to retire. He chilled from time to time – sat over the radiator all evening with a blanket around him. I told him to go to bed but he wanted to get his five doses down before retiring. He is tucked in now with heating pad but says he feels better. I noticed Mark sounded nasal after we got here so I used some nose drops on him when I tucked him in. If he isn’t better in the morning will do something about his cold. So far the rest of us are all normal, except my sinus drainage which I have had all winter, so nothing to be alarmed about. This evening we talked a lot about you and looked at your pictures. Ruth got out some of your letters and read excerpts from same. She got out the world books and read about places and things. [page 2] Last night we had our usual gift exchange. Dorothy wanted to see David get his gifts so I kept him up until 8 P.M. and she & Buddy came out and we gave him his gifts. Before she got there he spied the dog behind the tree Jimmy Staton had given him – It wasn’t wrapped. He wanted it so much we gave it to him. He holds his toys and we say “love the dog” (cat, etc.) and he pats some wrinkles up his nose and makes a funny little noise that is his way of loving. He had quite a time with all his gifts, which included plastic block, wood blocks, dogs, a jeep, bathrobe, house slippers and several wooden toys. I held J. & M. off for a while after David was put to bed. We had boxes with gifts from Jim & Thelma, Ruth & Floyd, & Ruth M. – I gave John records and money. I gave Mark some work sets – and things he likes to play with. They both thoughts they had a nice Christmas. Jim sent me a navy pin – it has the Lt. bars – is very pretty. It is 11:30 & I am sleepy – Ruth said they would all sign this in the morning & let David make a mark. P.S. I tried to hold David’s hand and he didn’t like the idea. The pencil mark are his. 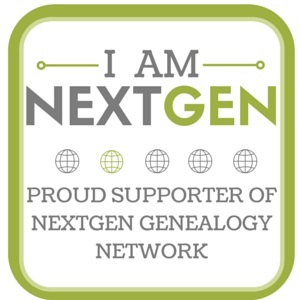 This entry was posted in Genealogy and tagged Christmas, David A. Yegerlehner, Dorothy Krull, Dr. Wilson, Floyd V. Yegerlehner, genealogy, Gladys R. (Foster) Yegerlehner, Indiana, James L. Foster, James L. Staton, Jerry, John Earl Mutchler, John F. Yegerlehner, Kentland, Mark A. Yegerlehner, Nicholas P. Krull, Roscoe S. Yegerlehner, Ruth (Salter) Yegerlehner, Ruth E. (Yegerlehner) Mutchler, Thelma (Mayrose) Foster, Wilmington, World War II, World War II letters on August 29, 2015 by Deborah Sweeney. 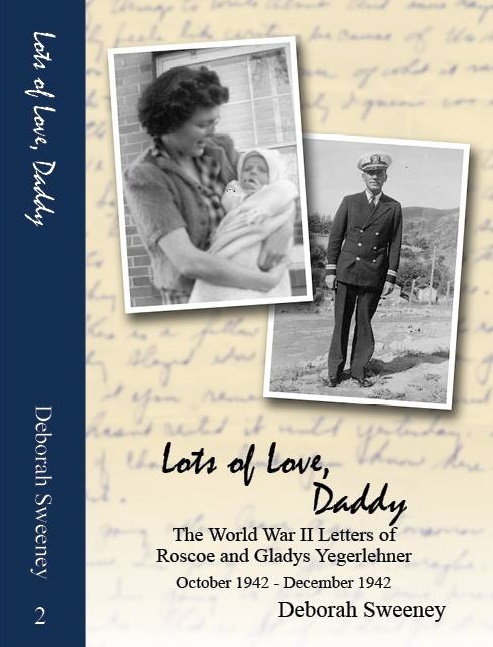 Dear Daddy – Two letters came today (Dec. 8 & 9). I had five yesterday up to Dec. 12. Also your cable greeting. Sorry we can’t return a cable but sent a regular greeting and some extra good pictures of David and hope you get them this week. Lucile is bringing Jimmy out and I am going to take care of the two boys while Lucile goes to club – she is on the committee and should attend. It is so nice out today I want to keep the boys out in the sunshine a while. Dr. M. gave Zells the report on the X-ray – Virginia has a crack in the back of her head and he says all they can do is keep her quiet. She has been very ill from the fall and is just beginning to eat, after a week since the accident. I stopped to see Arlene – she hasn’t gone to the hospital. Bill has the flu and Dr. C. told her if she got it to go right to the hospital. She hasn’t any help yet – Louise got the flu and being pregnant hasn’t recovered very rapidly. Dienharts have another baby (girl). I think it came a little too soon. Betty had to have a section done for the first baby – I see Jimmy & Bobby out playing together. The Zell girls are not out today. Betty won’t have to go to school this week – the first & second grades were dismissed until vacation is over due to so many being absent with cold, etc. So with Virginia home, all the Zell girls are home. It’s about time for Lucile to come. 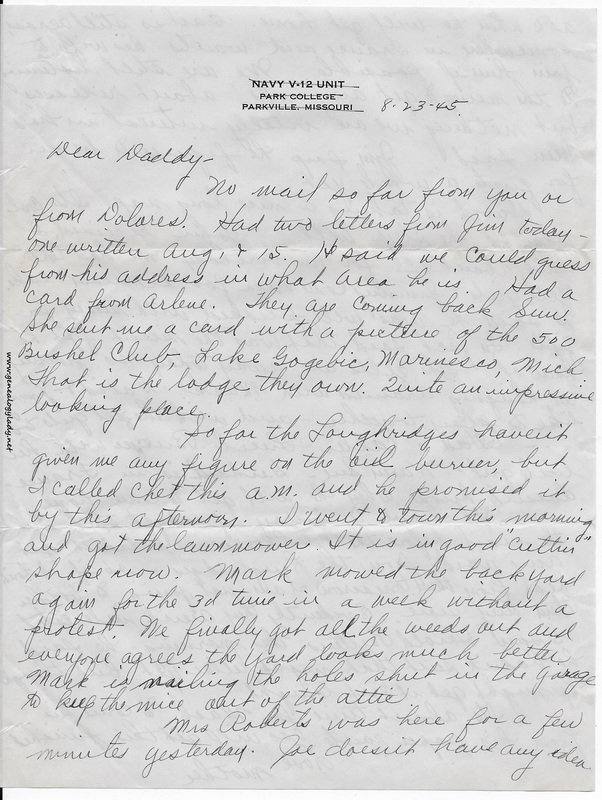 This entry was posted in Foster, Genealogy, World War II, World War II Letters, Yegerlehner and tagged Arlene Funk, David A. Yegerlehner, Dienhart, Dr. Ira Cole, Dr. Mathews, Elizabeth Zell, Gladys R. (Foster) Yegerlehner, Indiana, James L. Staton, Jimmy Ed Johnson, John F. Yegerlehner, Kentland, Louise (Krull) Glenn, Lucile Johnson, Mark A. Yegerlehner, Martha Zell, Norma Zell, Robert "Bobby" Funk, Roscoe S. Yegerlehner, Russell Zell, V-mail, Virginia Zell, William Funk, World War II, World War II letters on August 21, 2015 by Deborah Sweeney. Yours of Dec. 1 & 2 came today. Thanks for the check. Our bank acc’t is low ($49.00) so that will boost it somewhat. When I can find the time will send you a complete financial statement for 1943. I have the checks listed under their respective distributions (to Dec. 1) but haven’t added the long columns yet. I put a few figures in a letter last week, about Ins., Bonds, etc., but those didn’t take much adding. It doesn’t seem possible I wrote checks to cover all the money I put in the bank in ’43 but I have the checks and they all were essential – with the exceptions of a piano, fur coat, etc. However a goodly amt. went into Ins., the house & bonds. David is still coughing a little, but hasn’t any temp. I am still giving him sulfadiazine. I haven’t had him anyplace where he could get such a cold but he has one. 37 were out of school today (high). Irene, Mrs. J. & Jimmy are all down with flu. I called Link and talked to him. I told him David was under the weather. [page 2] and I can’t leave him now but could come over after school if I could do anything to help. He said he had gotten them all fed and they were pretty well taken care of then. They had Dr. M. yesterday and today. I didn’t call the Dr. to come I just asked him about giving sulfa & he told me what dosage to give and how often. David is asleep now. Hope he takes a nice long nap. I try to keep him in his bed but he gets tired of being kept up, so have to turn him loose when he gets to dissatisfied. He takes his stuffed toys and loves then, then throws them down. He pulls the lovey stuff on me too when he wants something very much. He certainly understands things we say to him. I told him he couldn’t crawl around the floor. He got down and began to crawl. I said “do you want me to put you back in your bed,” and he quit crawling. I put him on the toidey seat just as soon as he finishes his breakfast and he usually has his first B.M. I am not always lucky enough to get the next, but if I put him on the toidey after his nap he usually saves a diaper. He tries to feed himself, but to keep from wasting Pablum I give him a spoon to work with and at the same time feed him with another spoon. [page 3] He won’t allow me to help him guide the spoon he holds and doesn’t seem to notice I am feeding him at the same time he is trying to feed himself. He can hold his cup to drink from but is a little awkward so I usually hold the cup. John was relating some school happenings yesterday. He sounded so much like you in his tone and mannerism I told him you couldn’t have sounded more like yourself. They had to give reports on certain animals and the Dean Davis boy in John’s class gave a report on monkeys. You recall Davises used to have a pet monkey. John doesn’t care for the D. boy and ended the discussion with this observation, I wonder if the Davises were trying to find a twin for Dwane when they got that monkey. He was so droll about it – Just like his Dad. I see in the paper that Ira Dixon is going to engage in the practice of law. He was admitted to the bar in 1913, according to the paper. As has been the custom the Dem. comes on Thurs. and the Newton Co. usually tags in on Fri. I told J. & M. their Christmas money would come in a day or two – I also told them they could buy themselves a fresh supply of cod liver oil out of their own money. I don’t know how they could get more benefit from spending on themselves, do you? [page 4] Mark has been playing football all fall. He came in at noon with a bad thumb. Thought he couldn’t cut his meat and when I pointed out it was hamburger, got along with his fork. He takes the prize about so many things. I tell him he gold bricks. Sometimes he will say, “Now Mother don’t think I am trying to ‘gold brick.’” He was done all his Christmas shopping and has his gifts wrapped and under the tree. He is so full of anticipation for Christmas. It’s good to have someone in the house like that. John is rather matter-of-fact about things. I told both boys our bank acc’t is low right now, so John said, to cut down on Christmas spending (now who is that like?). Not that I was throwing money around on elaborate gifts. I have a few things I think Mark will enjoy, some toys for D. and want to get a record or two for John. He will probably get himself some records with the money you send. Dot Salter Huffman sent me a roll of film and Lucile sold me one so now I have two rolls and can get some more snaps of D. and the rest of us. Dot works for Easley and knew I wanted film, hence the roll from her. Katie Fletcher works at the NuJoy and gets film for Lucile – You really have to be on the inside track to get film not. 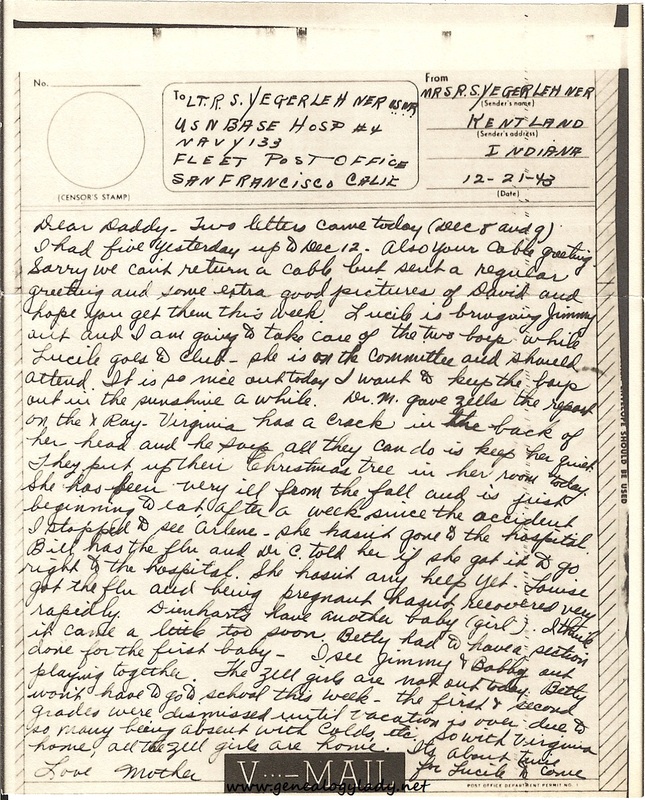 This entry was posted in Foster, Genealogy, World War II, World War II Letters, Yegerlehner and tagged Cora A. James, David A. Yegerlehner, Dean Davis, Dorothy (Salter) Hoffman, Dr. Mathews, Dwane Davis, genealogy, Gladys R. (Foster) Yegerlehner, Indiana, Ira Dixon, Irene (James) Staton, James L. Staton, John F. Yegerlehner, Katie Fletcher, Kentland, Kentland Democrat, Lloyd K. Staton, Lucile Johnson, Mark A. Yegerlehner, Newton County Enterprise, NuJoy, Roscoe S. Yegerlehner, World War II, World War II letters on July 26, 2015 by Deborah Sweeney. Today being the second anniversary of Pearl Harbor much has been said on the subject over the radio. Today was Literary Club Christmas meeting at Mrs. Mathews. I didn’t go. Went to Music Club yesterday, and plan to go to Laf. tomorrow, so thought I had better stay home this afternoon and do a few things. David is up from a too short nap – walking around looking for something to amuse himself. He was bothering the coffee table but I got him away from there. He knows he should leave it alone but doesn’t always do that. I just cleaned the mirror door and hear him there now, and know it will be smeared again. Just so he doesn’t pound on it with something hard I allow him to play there. John wrote you a v-mail last nite. Mark wrote one several days ago but didn’t mail it – I’ll try to get it in today’s mail. It is nice and sunny out today. Yesterday it was cold and cloudy and I thought winter had started but it’s warmer today. No letters now for over a week but I keep looking. I see Jimmy and Martha chasing a little Pekineese (Poor dog). 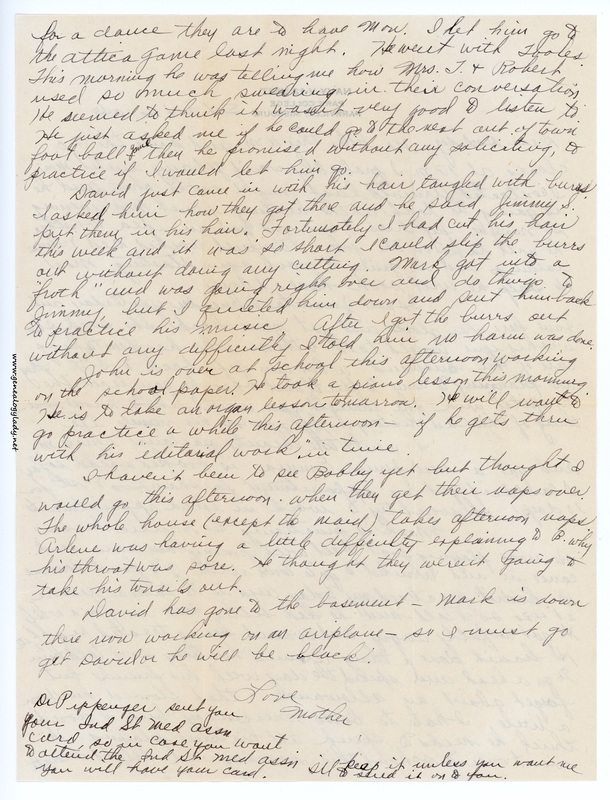 This entry was posted in Foster, Genealogy, World War II, World War II Letters, Yegerlehner and tagged Alta (Bittles) Mathews, David A. Yegerlehner, Gladys R. (Foster) Yegerlehner, Indiana, James L. Staton, John F. Yegerlehner, Kentland, Literary Club, Mark A. Yegerlehner, Martha Zell, Music Club, Pearl Harbor, Roscoe S. Yegerlehner, World War II, World War II letters on July 22, 2015 by Deborah Sweeney. No letters for four days but maybe a bunch will come tomorrow or Mon. It is a typical grey wintry day – however not very cold. The checks just came today so must go to the bank and make a dep. I am running low, but will try to give you some idea about the status of our finances when I get thru writing. At least we won’t have to pay int. on Ins. loans this Dec. I paid the balance on the piano today. Had it tuned and that cost $5⁰⁰. I will pay all the groc. bills, etc., while downtown this afternoon. I am keeping all bills paid – that is why I am so short of cash on hand but I would rather not allow bills to accumulate. I am not going to spend much on Christmas gifts this year. There isn’t much use to go shopping – the stores just haven’t the stock for the Christmas trade they had last year. 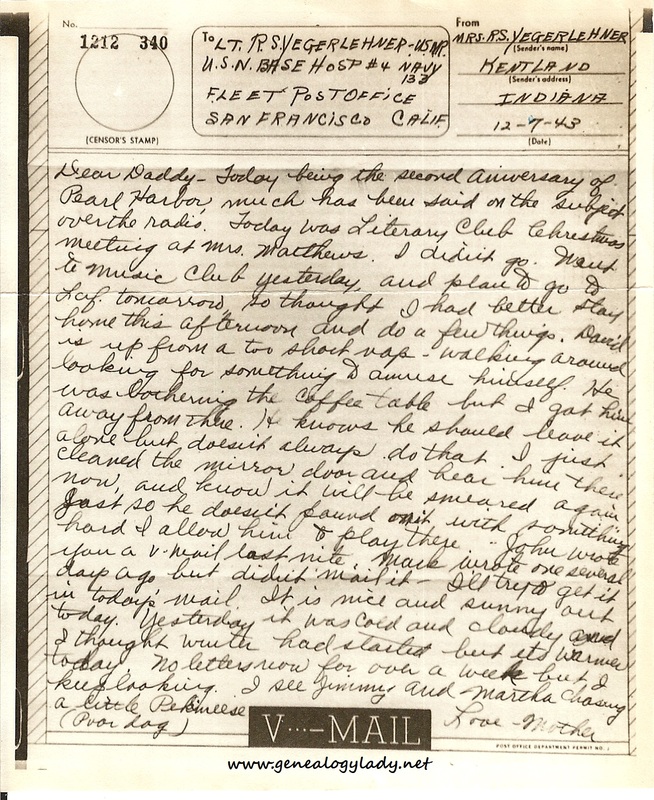 Had a letter from Ruth M. and she wants to either come here or us go there for Christmas. I wasn’t planning to go to C.C. I think it isn’t best to take David away during the cold weather to stay so long. There too would have to get the neighbors to look after the furnace and that is too much trouble to ask of anyone. I think I am going to suggest the Mutchlers coming here, if they can manage their gas situation. I would much rather stay home. Dorothy has asked us to come there for the day, but family comes first and if we can arrange with Ruth will spend the day with them here or there. [page 2] Leo Sondgerath had a ruptured appendix. He is in St. E. and seems to be getting along, according to the Newton Co. E. Bluford Healy had pneumonia and was quite serious, but is better now. His wife went to Ft. Bliss, Texas, to be with him last week. David woke up a little grouchy from his nap. It isn’t sunny today so won’t take him out in his buggy. Will go in the car so I can get groceries. I am buying homogenized milk for him at Bair’s now and today is when the fresh supply comes in (Tues. & Fri.). He tries to say some words when we talk. So far we have to guess at most of his words or expressions. Mark is pretty good at interpreting his talk. He is trying to feed himself and I think will soon be able to manipulate spoon from bowl to mouth without too much loss of food on the way. John and Mark played Monopoly last night and had Virginia come over and play with them. I told them no arguments or I wouldn’t allow them to play. They do pretty good. I saw “Ma” out chasing Jimmy. He wants to stay out and she wants him to go in. He runs and she can’t catch him. She hadn’t been so well, but now that we aren’t out in the yard much I don’t see her much. I think Irene goes to Chi. for thyroid treatment quite often. She isn’t to have an operation but takes iodine. The Factory is building an addition and intend to move the Chi. Plant here. I think the new addition will be almost as large as the original. I must do some figuring so I can go to town and give you an idea about finances. I hear a plane going over – sounded so low – might have touched the tree tops. Every time I hear one go over I think it might be bringing you home. By the time all current bills are paid there won’t be much balance if any – but maybe next month it won’t be so bad – or will it? 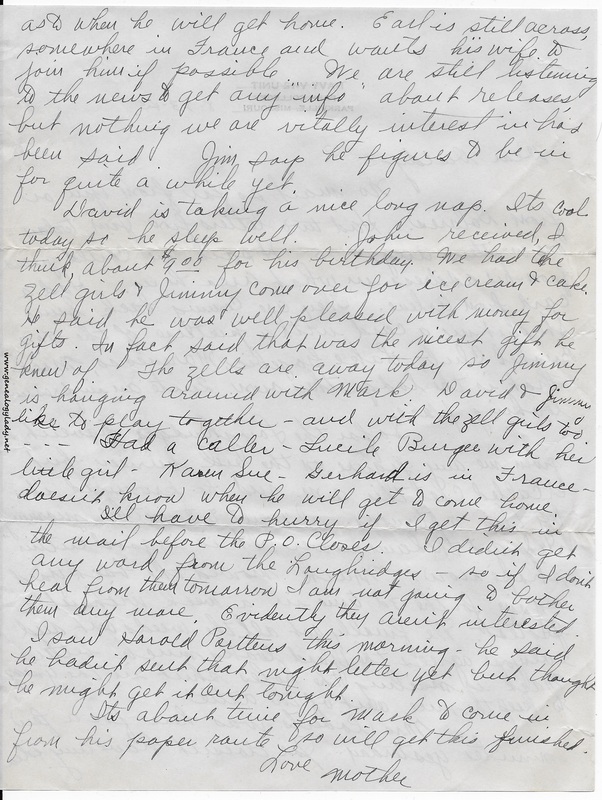 This entry was posted in Foster, Genealogy, World War II, World War II Letters, Yegerlehner and tagged Bairs, Bluford Healy, Cora A. James, David A. Yegerlehner, Dorothy Krull, Fort Bliss, genealogy, Gladys R. (Foster) Yegerlehner, Indiana, Irene (James) Staton, James L. Staton, John F. Yegerlehner, Kentland, Leo Sondgerath, Mark A. Yegerlehner, monopoly, Roscoe S. Yegerlehner, Ruth E. (Yegerlehner) Mutchler, St. Elizabeth's Hospital, Virginia Zell, World War II, World War II letters on July 10, 2015 by Deborah Sweeney.